His rhetorical question in 1980, when he ran against Jimmy Carter was, 'Are you better off today than four years ago?' There was no question that America had stagnated under Carter administration with double digit inflation (13%), and interest rates (18%) as well as very high tax rates. 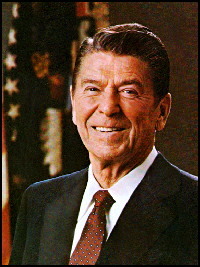 Reagan once quipped, 'Government's view of the economy could be summed up in a few short phrases: If it moves, tax it. If it keeps moving, regulate it. And if it stops moving, subsidize it.' Reagan believed in less Government and in unleashing the spirit of entrepreneurship of Americans, and then moving out of the way. Regan has left a legacy of prosperity that is enjoyed even now by Americans. The demise of Communism took more bold and controversial steps. Until then both the Soviet Union and the United States had relied on d'tente, a mindset wherein both sides took extraordinary measures not to cross each other's paths. Reagan saw that the Soviet Union was unsustainable and put pressure on it by increasing defense spending, modernizing the U. S. military and threatening to deploy the so called Strategic Defense Initiative (derided by the press corps as unattainable 'Star Wars'). He deployed missiles in Europe and challenged the Soviet Union to counter them. The cocky Soviets, who audaciously walked out of an arms summit in Reykjavik in Iceland, had to face reality and tow the line. He boldly accused the Soviet Empire as a country that fostered evil around the world. He challenged Gorabachov to tear down the Berlin wall, a symbol of Communism and slavery (and the world gasped!). With the help of Margaret Thatcher - the iron lady of Great Britton, and Pope John Paul II, Reagan made his vision come true. The repressive Soviet regime broke into several democracies. Today, only North Korea and the little island of Cuba practice old style communism. It is no wonder the only words Fidel Castro could come up with after Reagan's death were these: Reagan, a man who should not have been born, died today! The optimist we had come to know, who genuinely touched the hearts of Americans, has been dead for a decade. Yet, his death has touched all of us and the loss is felt deep in our cores. He proved time and again that he connected with the people of America. But the press had refused to believe it. His words of consolation to Americans after the Challenger disaster, where the teacher Krista McAuliffe had perished, ring in our ears even today. His genuine affection was obvious to people even when he visited a cemetery in Bitburg, Germany but the liberals criticized him for being insensitive to the Jews and being manipulated by anti-Semitists. But American people saw a different picture than that the press wanted to portray. They saw a man, genuinely moved by rows and rows of dead soldiers. He was merely paying his respects and not playing politics. The visit was not a photo opportunity neither was it staged.